There is increasing role of computed tomographic (CT) in the assessment of acute chest pain in the emergency department especially when the diagnosis is not clear. We report a case where non ECG gated contrast enhanced CT in the emergency department for rule-out of pulmonary embolus guided to the actual diagnosis, which was, acute coronary event, as evidenced by the presence of perfusion defect. Keywords: ACS, Contrast CT, MI, Perfusion defect. Chest pain is a common symptom, accounting for about 1% of GP visits, 5% of emergency department visits and 40% of emergency hospital admissions . Conditions causing chest pain or discomfort, such as an acute coronary syndrome or angina, have a potentially poor prognosis, emphasising the importance of prompt and accurate diagnosis. Patient assessment includes history taking, clinical examination and investigations including blood tests, ECGs, cardiac enzymes and CXR. Unfortunately diagnosis is not always simple, and a lot of cases present as a challenge especially when the investigations are not conclusive e.g. non-diagnostic ECG changes, borderline elevation in cardiac enzymes and misleading history of chest pain etc. There is increasing role of cardiac imaging in the assessment of acute chest pain in the emergency department especially when the diagnosis is not clear [2-4]. For example, triple-rule-out (TRO) computed tomographic (CT) angiography could provide evaluation of the coronary arteries, aorta, pulmonary arteries, and adjacent intrathoracic structures for the patient with acute chest pain. TRO CT is most appropriate for the patient who is judged to be at low to intermediate risk for acute coronary syndrome (ACS) and whose symptoms may also be attributed to acute pathologic conditions of the aorta or pulmonary arteries [5-7]. Urgent non-electrocardiogram-gated contrast-enhanced computed tomography (non-ECG-gated CT) is available to most emergency department in hospitals where patients with chest and/or back pain are admitted. Although it has been established as the initial diagnostic imaging modality for acute aortic dissection (AAD) and pulmonary thromboembolism (PE), there is limited literature on its diagnostic ability for acute coronary syndrome (ACS) in the emergency department. One study has shown some benefit of detecting perfusion defect on non-ECG gated CT in diagnosing ACS . We report a case of a 52 years old man, previously fit and well, who presented to the emergency department with central chest pain radiating to the back and of grade 10 out of 10 severity. Glyceryl Trinitrate (GTN) spray helped relief the symptoms initially, but pain returned back shortly after. In the emergency department, the patient had 12-lead ECG (Fig. 1), blood tests including cardiac biomarkers like troponin. His ECG showed nonspecific changes of ST-depression and T-wave inversion in the inferior leads. The high-sensitivity Troponin was raised at 1403 ng/l. As a result of the on-going atypical chest pain and non-specific 12-lead ECG changes, a diagnosis of aortic dissection was considered and patient has had an urgent non-ECG-gated contrast enhanced CT of the chest (Figs. 2 and 3) and also a bedside transthoracic echocardiogram was performed to rule out acute aortic syndromes. His contrast enhanced CT chest didn’t show any evidence of acute aortic dissection, but on further assessment in the transverse plane through the cardiac plane, an anterio-septal to apical trans-mural perfusion defect was clearly identified. On quantitative analysis on the four-chamber view, the Hounsfield Unit (HU) for region of interest (ROI) in the perfusion defect was 40.8 HU (±6.9 HU) compared to remote myocardium where it was 94.5 HU (±7.3 HU) (Fig. 4). 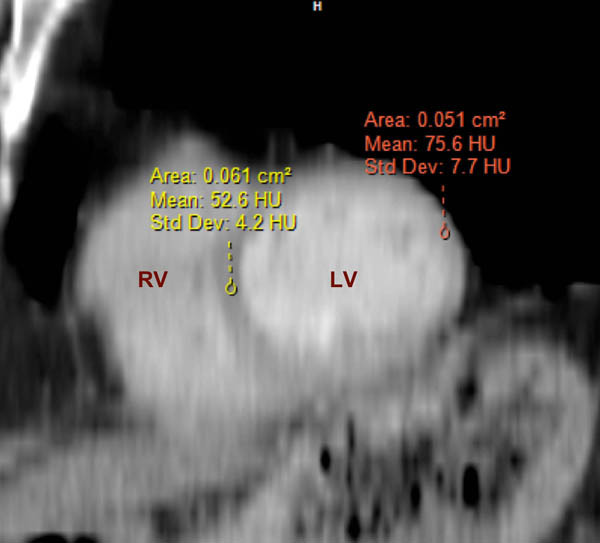 On short-axis view of the heart re-constructed using multiplanar re-construction (MPR), confirmed the perfusion defect in the intra-ventricular septum and apical segments (the Hounsfield Unit in the perfusion defect was 52.6 HU (±4.2 HU) compared to remote myocardium, 75.6 HU (±7.7 HU)) (Fig. 5). This raised the suspicion of acute myocardial infarction and patient was immediately transferred to cardiac catheter laboratory for urgent coronary angiography. This was also further supported by the bedside transthoracic echocardiogram, which showed hypokinesia of the anterior segments. 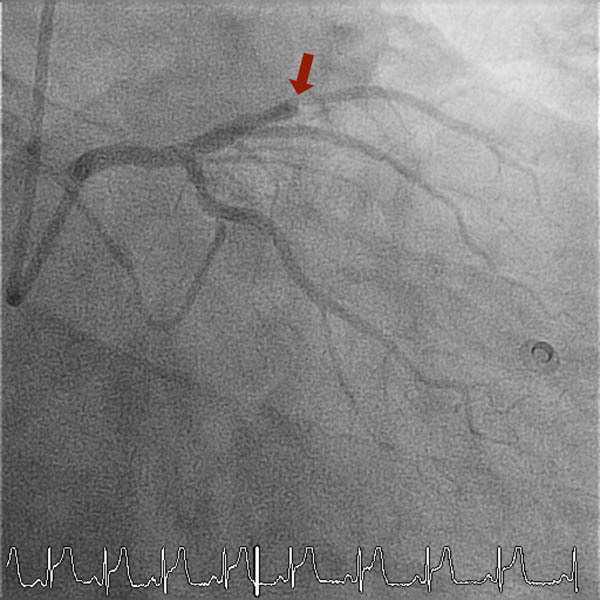 Invasive coronary angiography showed complete occlusion of his left anterior descending (LAD) artery (Fig. 6). This was reperfused by balloon angioplasty after which two drug-eluting stents were implanted in the LAD. Post stenting fluoroscopy showed normal patency of the LAD with TIMI 3 flow down it (Fig. 7). Standard protocols were followed for post percutaneous coronary intervention treatment and rehabilitation [9, 10]. Patient made un-remarkable recovery and was discharged home two days later. This case highlights the positive impact of non-ECG gated contrast enhanced CT imaging on the patient management and outcome in the real world clinical practice. Also, both the qualitative and quantitative assessment of perfusion defect were in agreement. Fig. (1). 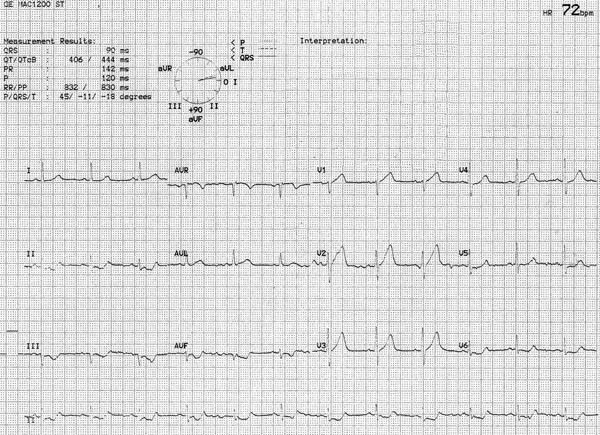 12-lead electrocardiogram showing non-specific ST-depression and hint of possible ST-elevation in the anterior leads (V1-V3) with some evidence of high-take off of T-waves in V1-V3. Fig. (2). 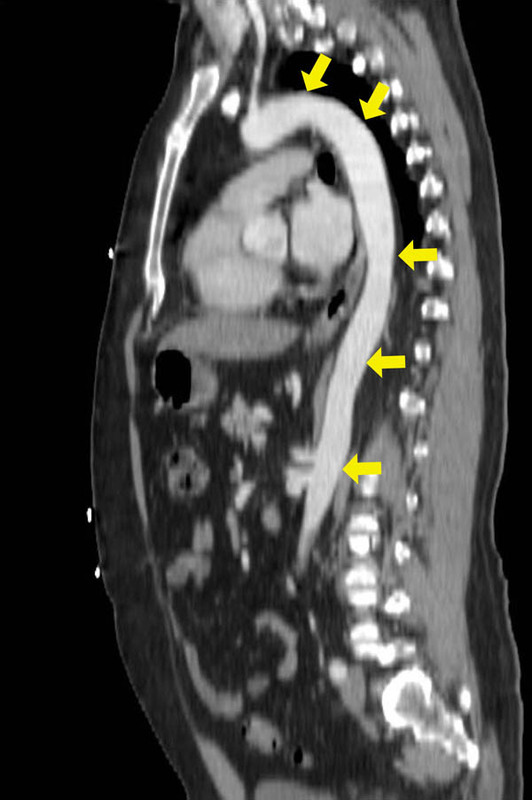 Non-ECG gated contrast-enhanced computed tomography in sagittal-plane showing normal aortic root (yellow arrows). Fig. (3). 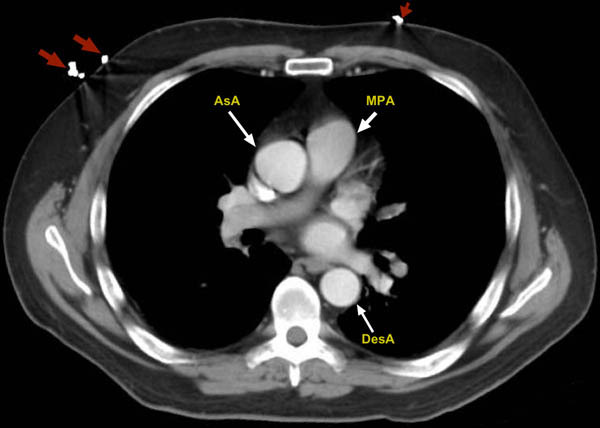 Non-ECG gated contrast-enhancedcomputed tomography in axial-plane showing normal ascending aorta (AsA) and descending aorta (DesA). MPA - Main Pulmonary Artery. Fig. (4). Non-ECG gated contrast-enhanced computed tomography in axial-plane; on a four-chamber view of the heart, showing perfusion defect in the intra-ventricular septum and apical segments (black arrows). On quantitative analysis, the Hounsfield Unit (HU) for region of interest (ROI) in the perfusion defect was 40.8 HU (±6.9 HU) compared to remote myocardium 94.5 HU (±7.3 HU). Fig. (6). 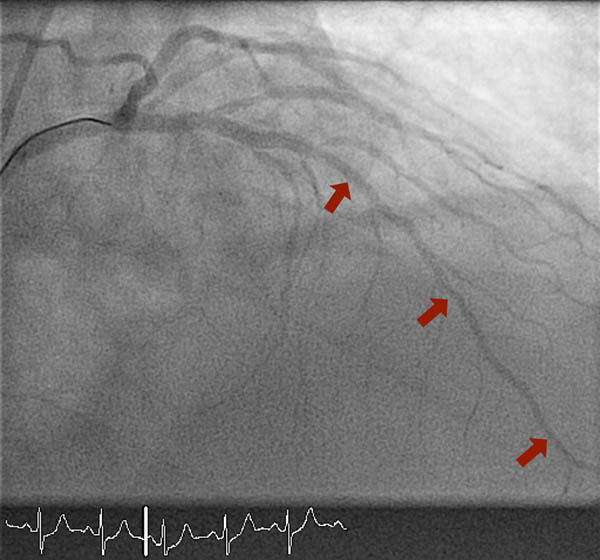 Invasive coronary angiography clearly showing the occluded LAD pre angioplasty (red arrow). Fig. (7). Invasive coronary angiography post angioplasty to the LAD showing restored circulation with TIMI 3 flow down the LAD (red arrow). Non ECG gated contrast enhanced CT, a simple, cost-effective and widely available imaging modality, can provide a considerable amount of information in the emergency department, not only to exclude conditions like aortic dissection and pulmonary embolism, but also to facilitate the diagnosis of ACS. Large scale studies are warranted to clarify the usefulness of non-ECG gated CT in diagnosing ACS; ruling-out other clinically relevant differentials; the potential short-term/long-term clinical impact and assessing it’s cost-effectiveness. Ruigómez A, Rodríguez LA, Wallander M-A, Johansson S, Jones R. Chest pain in general practice: incidence, comorbidity and mortality. Fam Pract 2006; 23(2): 167-74. Hoffmann U, Truong QA, Schoenfeld DA, et al. Coronary CT angiography versus standard evaluation in acute chest pain. N Engl J Med 2012; 367(4): 299-308. Sechtem U, Achenbach S, Friedrich M, Wackers F, Zamorano JL. Non-invasive imaging in acute chest pain syndromes. 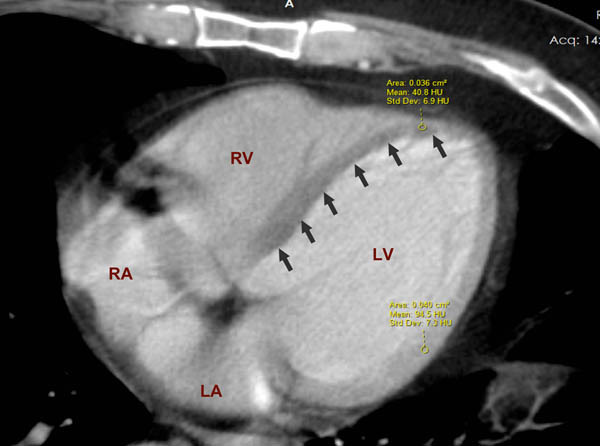 Eur Heart J Cardiovasc Imaging 2012; 13(1): 69-78. Wackers FJ. Chest pain in the emergency department: role of cardiac imaging. Heart 2009; 95(12): 1023-30. Halpern EJ. Triple-rule-out CT angiography for evaluation of acute chest pain and possible acute coronary syndrome. Radiology 2009; 252(2): 332-45. Ayaram D, Bellolio MF, Murad MH, et al. Triple rule-out computed tomographic angiography for chest pain: a diagnostic systematic review and meta-analysis. Acad Emerg Med 2013; 20(9): 861-71. Takakuwa KM, Halpern EJ. Evaluation of a “triple rule-out” coronary CT angiography protocol: use of 64-Section CT in low-to-moderate risk emergency department patients suspected of having acute coronary syndrome. Radiology 2008; 248(2): 438-46. Mano Y, Anzai T, Yoshizawa A, Itabashi Y, Ohki T. Role of non-electrocardiogram-gated contrast-enhanced computed tomography in the diagnosis of acute coronary syndrome. Heart Vessels 2015; 30(1): 1-8. Steg PG, James SK, Atar D, et al. ESC Guidelines for the management of acute myocardial infarction in patients presenting with ST-segment elevation. Eur Heart J 2012; 33(20): 2569-619. O’Gara PT, Kushner FG, Ascheim DD, et al. 2013 ACCF/AHA guideline for the management of ST-elevation myocardial infarction: a report of the american college of cardiology foundation/american heart association task force on practice guidelines. J Am Coll Cardiol 2013; 61(4): e78-140.